A few years ago I found a recipe for plum pie in this Canadian Living cookbook, what I liked about it was the slight taste of walnuts mixed with the flavour of plums all encased in a bit of custard filling. It became one of my favourite pie recipes (I posted about it here last year) and I looked forward to plum season each year. I also filled my freezer with plums so that I could make it more often if I wanted. 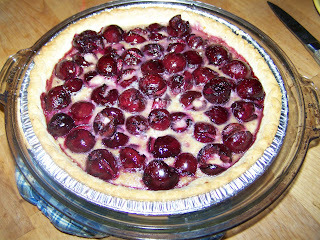 The other day as I was pitting cherries I thought that cherries might work just as well in the recipe. I tried it and it was delicious. This recipe is so good that I could easily eat the whole pie myself...in one sitting...easily...and still want more, the problem is that so could the other three people I live with.